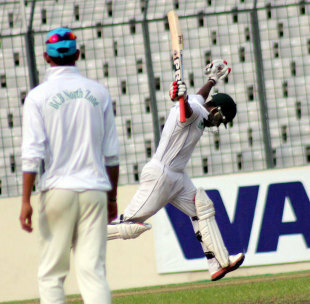 South Zone's Imrul Kayes lit up a dull day in Mirpur with his maiden double-hundred in first-class cricket. His 204 pushed North Zone virtually out of the contest on the third day of the BCL final. South's lead has now swelled to 446 runs, and they are in position to dictate terms, with seven wickets and two days remaining. They batted out the entire third day, making 410-3 with Imrul's double and Mithun Ali's eighth first-class hundred. Early morning rain delayed the start of play by 45 minutes, but it hardly deterred the South Zone openers. Anamul Haque fell after adding 57 for the first wicket, followed by an 80-run second wicket stand between Imrul and Soumya Sarkar, who made 41. The latter was needlessly run out in the 38th over, after Imrul called for a single and Soumya hesitated before he was caught well short of the crease at the striker's end. Imrul batted with less patience than Mithun, who hardly put a foot wrong. The pair had to constantly tackle the in-form Taijul Islam and Sanjamul Islam, both left-arm spinners bowling in tandem in the afternoon session. Imrul smashed nine sixes and 20 fours in his stay at the crease, lasting one minute short of six hours, while Mithun struck 13 fours and five sixes in his unbeaten 111. The 254-run stand between Imrul and Mithun hardly had a glitch, except for Imrul popping half-chances close to short-leg, cover and long-on. The last of those didn't make North Zone captain Nasir Hossain happy and he expressed himself quite loudly, with Imrul batting in the 190s at that point. Soon, Mithun reached his hundred with a cover-driven four and Imrul tucked the ball around the corner to reach his first double-hundred. His previous best score was 138. Imrul said he always had a dream to reach the milestone, and that his team's dominance on the third day had taken them to a great position. "The match is completely in our hands. If we can bat for two sessions tomorrow we will give them the bat. We know that if we draw we will win the game." Imrul's dominance of Taijul looked risky at times, but he was always in control with his shots along the ground, even when he struck them straight to mid-on or mid-off. He struck five of his nine sixes off this left-arm spinner, never letting him settle for too long. He struck two sixes off Sanjamul and one each off Subashis Roy and Nasir Hossain. He explained that since the left-arm spinner was bowling with some flight, he took it upon himself to use his feet. "Actually I played to the situation," Imrul said. "If he gave me flight, any batsman will automatically go down the wicket. "Taijul has been bowling well in the last year. There are many quality left-arm spinners so in four-day cricket if we get in an attacking mode and play him normally, we can easily negotiate him. First I saw that if a batsman stretches out to play him on the front foot it will be very dangerous for him. If you use your feet against him, it will be easier." Taijul ended with figures of 1 for 109 off 27 overs while Farhad Reza took the wicket of Imrul late in the day, when the batsman hooked the ball straight to deep fine-leg.